It’s been a crazy week of wedding shenanigans! I feel like I just blinked and this week was over. It’s been non stop crafting, ceremony writing/practice, wedding rehearsal, so much happened this week! My focus has definitely not been on me this week, but that is OKAY! Totally worth it. 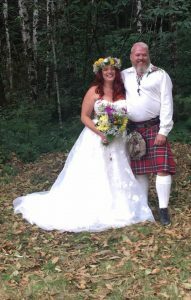 I did it, I married to of my friends, they are hitched! It was so much fun, I love this so much. I do have to say tho, that I am a little relieved that this is all over. Now I can get back to me. Lets see how I did this week. Stay hydrated – A – No problems in this area. 10,000 steps per day – F – No 10k days, but there were a lot of close days. Track all my food intake and maintain a minimum of a 500 calorie per day deficit – C – This was really hit and miss this week. No focus in this area. Keep moving throughout the day – Get out of my chair at work for a walk a minimum of three times per day – A – There was lots of up and downs out of my chair this week. Meditate 4 times per week – B – I got three days in. Post on my blog and get those 10k posts up on Facebook – F – I didn’t have any FB posts this week. Reflect on my goals daily – D – Missed this one. One hiking and/or adventure this week. – A – There was lots of wedding adventure this week. Lose one pound per week. – F – Gained 1.7 pounds this week GASP! Wow, kind of a crappy week in fitness, but still a totally fun week of wedding fun! I’m not too upset about it, I will get back on track this week. My focus this week will be getting back on the food tracking and those step counts. I have the Race for the Cure coming up in a couple weeks and I need to start getting conditioned for that adventure. I am also going to start making some smoothies as meal replacement options. My daughter, Athena purchased a complete Ninja Food processing system that includes the little shake glasses, she also bought some of this super yummy banana berry protein powder. I didn’t really like smoothies, but I tried the ones she makes and they are freaking delicious. This could really help me with the calorie tracking, and they are very nutritious and filling. Okay guys, see you all next week. I WILL have a better report card to share with you all. 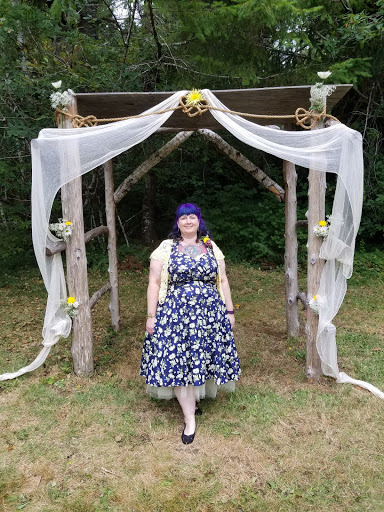 Have to give a shout out to my amazing sister-in-law, Sherri who made this incredible dress for the big wedding, it turned out so beautiful. Thanks Sherri, I love you and really appreciate all the hard work you put into my dress. Check this out you guys, AMAZING! Special shout out to my friends who are now Mr. & Mrs. Jewell! Thank you guys so much for choosing me officiate your marriage. I love you both so much and I had such a blast last week! Look at this beautiful couple, I married these guys!